PX, Morenita (cream), Marques de Rodil (Palo Cortado), La Panesa (Fino especial). All from Bodega Emilio Hidalgo, Jerez de la Frontera. I’m sure that many of you, when you hear the word “sherry”, start thinking about a nasty, sweet wine your grandmother or another old lady of your childhood was drinking. But sherry is a lot more than that, and it is a shame, that it is so “uncool” to drink. A friend and sherry expert even suggests, that it marketing-wise would be smart to change the name “sherry” to something else to prevent people’s prejudice before trying this wonderful wine from Southern Spain. But now, finally, sherry is getting more and more attention. 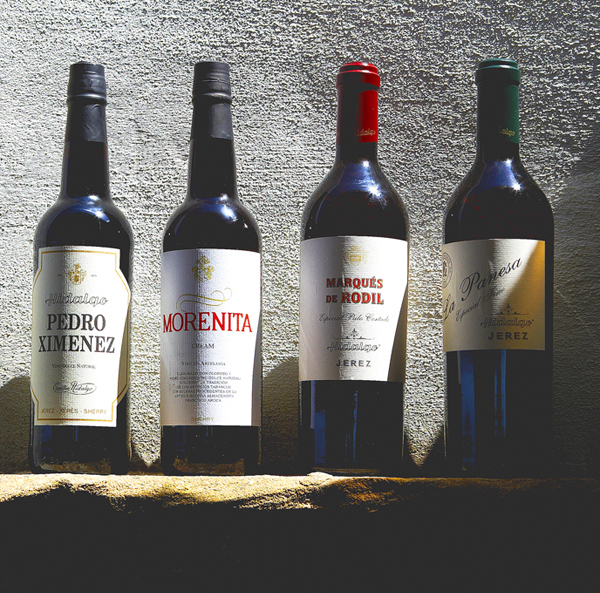 Sherry bars are popping up in many cities all over the world and wine experts praise sherry very highly. Sherry is made in the Cadiz province, in the área between Jerez de la Frontera, San Lucar de Barrameda and Puerto de Santa María, where it is a wine making tradition that goes back 3000 years. There are many kinds of sherries; a wide range from really, really sweet to ultra-dry.